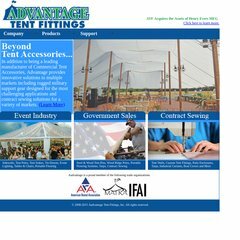 www.Aadvantagetent.com - Aadvantage Tent Fittings, Inc. Topics: Environmental Initiatives, Commercial, Government, and Contract Sewing. primary.dns.bright.net, and mail.horizonhelp.com are its DNS Nameservers. Com Net Inc (Ohio, Wapakoneta) is the location of the Apache/1 server. Its local IP address is 216.201.6.199.